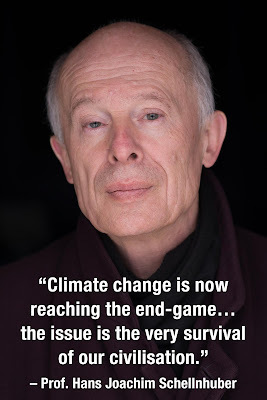 There is no carbon budget left for 1.5°C climate warming target, which means that to achieve this outcome every tonne of emissions must be matched by a tonne of drawdown of atmospheric carbon from now on. For that reason, carbon budgets and emissions target should be complemented by a carbon drawdown budget and target. That's the proposal made by Breakthrough, the Melbourne-based National Centre for Climate Restoration, to the Victorian climate change targets 2021-2030 expert panel, last week. “Overshoot” in emission reduction scenarios should be minimised in extent and duration to avoid tipping points that may be irreversible on human time-frames. Here's the story in more detail. 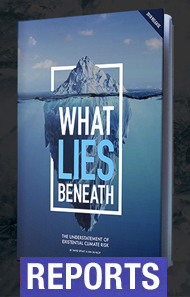 In 2015, researchers looked at the damage to system elements — including water security, staple crops, land, coral reefs, vegetation and UNESCO World Heritage sites — as the temperature increases. They found all the damage from climate change to vulnerable categories like coral reefs, freshwater availability and plant life could happen before 2°C warming is reached, and much of it before 1.5°C warming. 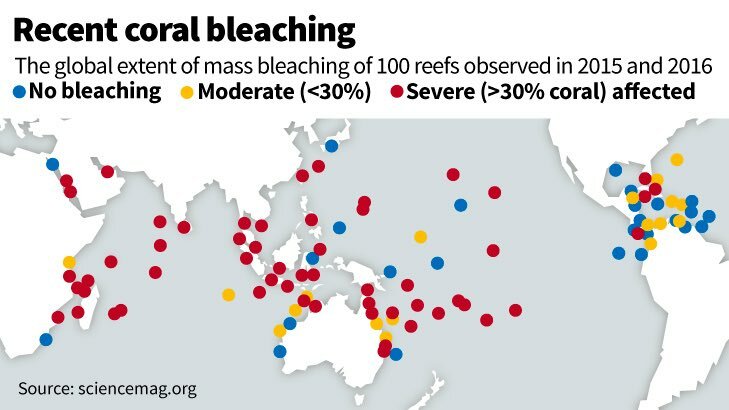 In 2013, Australian scientists contributed to an important research paper which found that preserving more than 10% of coral reefs worldwide would require limiting warming to below 1.5°C. Recent research found that the surge in ocean warming around the Great Barrier Reef in 2016-17, which led to the loss of half of the 2015 reef area, has a 31% probability of occuring in any year at just the current level of warming. 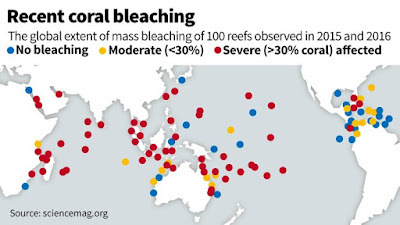 In other words, severe bleaching and coral loss is likely on average every 3–4 years at the present level of warming (1–1.1°C), whereas corals take 10–15 years to recover from such events. There is evidence that a 1.5ºC global rise in temperature is likely to cause widespread thawing of continuous permafrost as far north as 60°N. At 1.5°C, the loss of permafrost area is estimated to be four million square kilometres. By 1.5°C, a sea-level rise of many metres, and perhaps tens of metres will have been locked into the system. In past climates, carbon dioxide (CO2) levels of around 400 parts per million (ppm) have been associated with sea levels around 25 metres above the present. 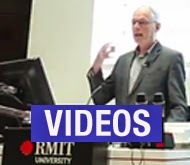 Prof. Kenneth G. Miller notes that “the natural state of the Earth with present CO2 levels is one with sea levels about 20 meters higher than at present”. The expected sea-level rise this century is generally in the range of one to two metres, but higher increases cannot be ruled out. The US military, for example, uses one- and two-metre sea-level-rise scenarios. The US NOAA provides an “extreme” scenario of 2.5 metres sea level rise by 2100. On carbon cycle feedbacks, it is worth noting recent work which shows that some tropical forests — in the Congo, the Amazon, and in Southeast Asia — have already shifted to a net carbon source, and recent work on a soil carbon feedback in a 26-year soil-warming experiment in a mid-latitude hardwood forest, in which warming resulted in a complex pattern of net carbon loss from the soil, supporting projections of a long-term, positive carbon feedback from similar ecosystems as the world warms. At the current warming of just over 1°C compared to the late nineteenth century, Earth is now approximately 0.5°C warmer that the maximum of the Holocene (the period of relatively stable temperatures over the last nine thousands years and the period of human civilisation), and as warm as it was during the prior Eemian interglacial period, when sea level reached 6-9 meters higher than today. It would be precautionary to establish a warming goal of less than 0.5°C, with the aim of cooling Earth back to this safe zone at the greatest possible speed. 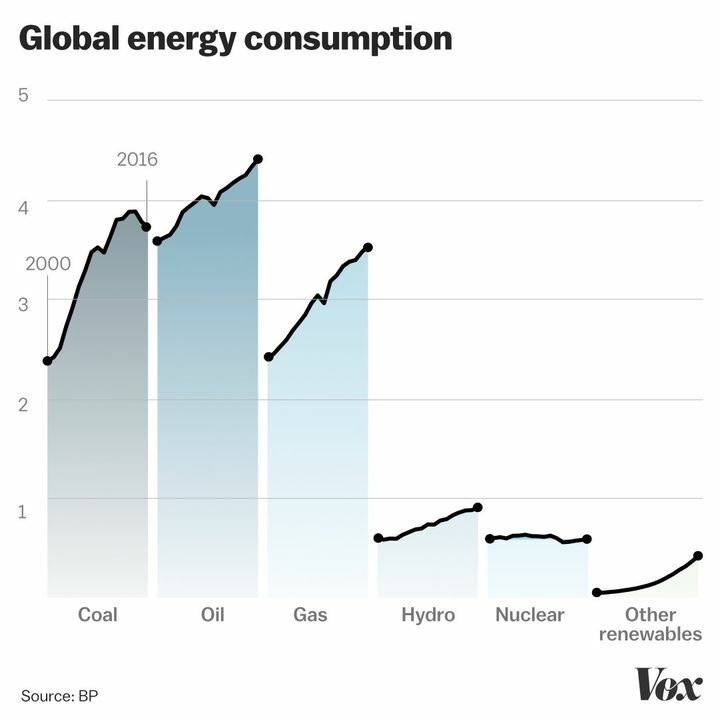 There is no carbon budget for 1.5°C, which means that to achieve this outcome, from now on every tonne of emissions must be matched by a tonne of drawdown of atmospheric carbon. The issues are canvassed at “Unravelling the myth of a ‘carbon budget’ for 1.5°C.” Rogelj et al. noted in 2017: “ If the 1.5°C limit should not be breached in any given year, the budget since 1870 is roughly halved and already overspent today” (emphasis added). In fact, today’s CO2 level if maintained would produce a lot more warming that 1.5°C. In the early- to mid-Pliocene 3–4.5 millions year ago, CO2 levels were similar today at 365–415 ppm but temperatures were 3–4°C warmer than pre-industrial values and sea levels were 25 metres higher. Warming is being masked by anthropogenic aerosol emissions, a good proportion of which are coming from fossil fuel extraction and use. This temporary cooling is estimated at 0.7°C, so global warming is likely to accelerate in the next few decades if the cooling influence of human-generated aerosols declines as predicted. When this is taken into account, the implied warming for the current level of greenhouse gases is more than 2°C. Climate scientists and economists who counsel policy-makers are being pressured to extend their models and options for delivering mitigation later. This has introduced dubious concepts, such as repaying ‘carbon debt’ through ‘negative emissions’ to offset delayed mitigation — in theory… Climate researchers who advise policy-makers feel that they have two options: be pragmatic or be ignored… Many advisers are choosing pragmatism… Each year, mitigation scenarios that explore policy options for transforming the global economy are more optimistic — and less plausible (emphasis added). A more rapid rate of emission reduction than generally associated with the Paris path can reduce the reliance on drawdown, and especially BECCS. A paper just out, “Alternative pathways to the 1.5°C target reduce the need for negative emission technologies”, is worthy of a close look, and some of its propositions could be adopted by the Victorian Government. Since all emissions from now on must be matched by at least an equivalent amount of drawdown: A Victorian carbon budget and emissions target should be complemented by a Victorian carbon drawdown budget and target. The adoption of a carbon drawdown budget would help to normalise as necessary what is still, too often, constructed as a distant and theoretical task. A recent paper by Kate Dooley at UniMelb, “Land-based negative emissions: risks for climate mitigation and impacts on sustainable development”, found the most cost-effective large-scale drawdown action is the restoration of carbon-dense and biologically rich natural forests. There are also opportunities for increasing soil organic carbon (SOC), where more research work needs to be done, but one estimate from the European Academies’ Science Advisory Council is that increasing SOC could have the potential to absorb 2-3 GtC/year. 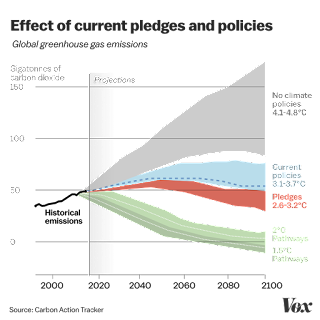 All 1.5°C scenarios involved “overshooting” the target before cooling back to 1.5°C by 2100. This overshoot should be minimised by adopting more stringent emission scenarios as the basis for policymaking. Global warming will pass the 1.5°C threshold in about a decade from now. 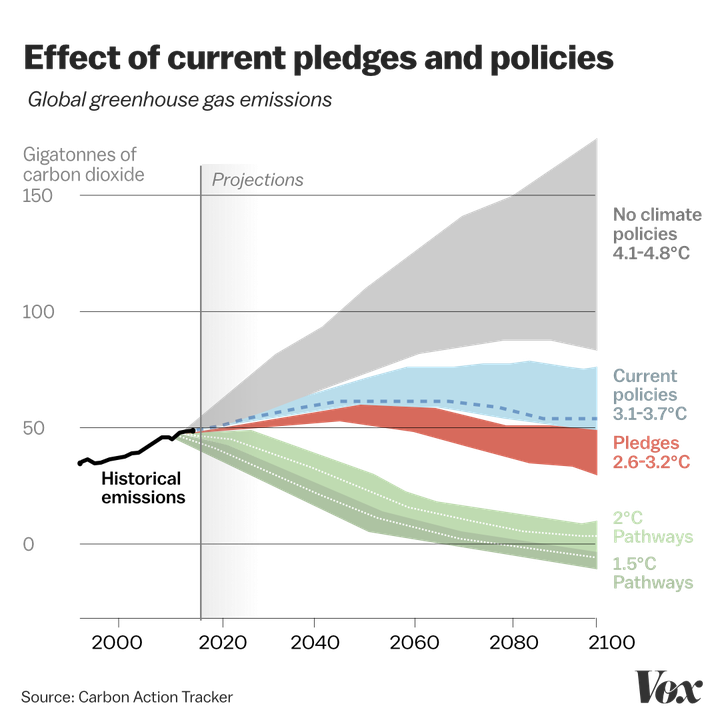 All 1.5°C emission scenarios include a period of “overshoot” towards 2°C, before returning to the 1.5°C threshold by 2100. On the present high emissions path, warming will hit the 2°C by the mid-2040s, and large reductions in CO2 emissions will not by themselves significantly delay this timing, due to the “Faustian bargain” we have struck with our reliance on aerosols — a by-product of fossil fuel use — that by their significant but very short-term cooling impact are masking considerable warming. Going to zero emissions with CO2 at ~420 ppm would result in a warming of around 2°C at equilibrium, if the level of short-lived gases was constant. Thus the 1.5°C overshoot will last several decades and up to half a century in the Paris scheme of things. There are specific dangers in overshooting, which increase both with the duration and the magnitude of the overshoot. Thus “overshoot scenarios”, which are now becoming the norm in policy-making circles hold much greater risks. Specifically, overshoot to 2°C for up to half a century may trigger events and activate tipping points that cannot be reversed even with significant cooling. Hence a more rapid rate of emission reduction than generally associated with the Paris path can reduce in extent and duration the overshooting of the 1.5°C threshold.